(CNN) -- Jenny Sanford said Thursday that her husband Mark Sanford's political career is "not a concern of mine" and that she'd be just fine -- regardless of whether their marriage survives. 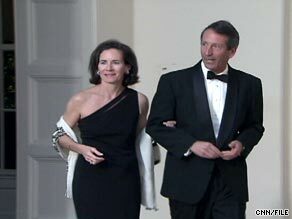 Jenny Sanford, here with her husband, was a Wall Street executive before she married Mark Sanford. She would not speculate whether her husband would resign as South Carolina governor. "I don't know if he'll be with me, but I'm going to do my best to work on my marriage because I believe in marriage. I believe in raising good kids is the most important thing in the world," she said. After disappearing from the public eye for nearly a week, Gov. Mark Sanford, 49, admitted to having an extramarital affair with an Argentine woman. He also admitted Wednesday that he had not hiked the Appalachian Trail during his absence -- as his staff had said earlier -- but had been in Buenos Aires, Argentina. Gov. Sanford, leaving the family home in a different car, was in a far less talkative mood. "I'm going back to Columbia," he said. The State, the Columbia-based newspaper that acquired what it said were e-mail exchanges between Sanford and the woman in Argentina, acknowledged Thursday that there would likely be people who would call for the governor's resignation. "We are not ready to join them at this point," its editorial said.